Happy Christmas to you and your loved ones. Sadly, as in previous years, some of our activists and campaigners have suffered illness and some have passed away. We are all grateful for their contributions over many years and our thoughts are with their families at this particularly difficult time of year. Each year my letter reaches new readers. I therefore take this opportunity in my Christmas message to explain the rationale for the National Defence Medal. "There has been injustice and inconsistency of medallic recognition of those who served and have kept the Nation and its interests safe and secure since the ending of the Second World War. Over the years this led to the formation of many medal campaign groups such as National Service veterans, Cold War veterans, Nuclear Testing veterans, Korea Post Armistice veterans, and Service personnel injured in conflict, to name but a few seeking medallic recognition. As the years have gone by, the campaigners representing these groups have all got older, some have become frail, others ill and many died. Consequently in 2007, the National Defence Medal campaign was launched by representatives of these organisations coming together to make one concerted effort to achieve medallic recognition in their life time through a generic medal should their own claims fail." In 2010, former Prime Minister David Cameron, directed this injustice and inconsistency be addressed with a line drawn in the sand on the matter of medallic recognition once and for all. "The loss of government department documents; a failure of the Advisory Military Sub-Committee (AMSC) of the Honours, Decorations and Medal Committee to appropriately review the NDM submission together with other medal submissions and with some submissions not reviewed at all; the absence of members of the Honours, Decorations and Medals Committee from key meetings which discussed the institution of the NDM; unsound decisions made by this committee and who, when made aware of these flaws, failed to take any remedial action; a failure by the Cabinet Office staff to exercise due diligence of the medal review process; the production and promulgation of erroneous NDM costs; the misleading of Parliament and the public; a less than adequate investigation into official complaints made about the flawed medal review process; the failure of the Cabinet Office to provide openness and transparency in respect of the review of the NDM; and the inordinate amount of undisclosed expenditure of taxpayers? money on legal fees to keep information of public interest on the medal review out of the public domain." Judgement on the release of information, regarding further alleged failings by the Cabinet Office in relation to the provision of a fair medal review, is awaited from four different FOIA Tribunals which are currently deliberating on their findings. Hopefully, the results of these Tribunals will be known within the coming weeks. I will ensure details of these judgements and judicial directions are placed on the NDM website as soon as they are received. Last year I closed my Christmas message by reminding those veterans, non-veterans and the media, who read my letter, that all the medal campaign groups have ever sought, yet continually been denied, is an open and transparent medal review, where their submissions are fairly assessed, and if they have a case, their submission is recommended to Her Majesty for medallic recognition, and if not, evidence based reasons are provided as to why not. This does not seem unreasonable or a lot to ask by our veterans who have kept this Nation and its interests safe and secure since the ending of the Second World War. After much work by the leaders of many of the medal campaign groups, on what seemed on occasions an almost impossible task, a Parliamentary statement was made on 13 November 2018, which indicated that the AMSC was to be reinstituted. I wrote to Sir Jonathan Stephens, the current Chair of the Honours, Decorations and Medals Committee, on behalf of the various medal campaign groups, requesting he confirm that all those medal submissions, which were either not reviewed appropriately or not reviewed at all by the AMSC in the 2012-2014 military medal review, would be reviewed by this reconstituted sub-committee and that the process would be open, transparent and not protracted due to an aging veteran community. "Both the Cabinet Office and the Ministry of Defence have received requests from campaigners for either historic decisions of the award of medals to be reconsidered or new claims to be considered. It is for these reasons that the Committee on the Grant of Honours, Decorations and Medals recommended to Her Majesty The Queen that the Advisory Military Sub-Committee be reinstituted earlier this year. Her Majesty graciously agreed to their request. Details of the Sub-Committee?s independent membership and terms of reference will be announced by the Cabinet Office in due course." Yesterday (11 December) I received a reply from Sir Jonathan Stephens to my letter of 16 November. He informed me that this newly reconstituted AMSC will commence work in the Spring of 2019 and that the independent Chair will be made aware of the history of the previous AMSC and the views of campaign groups such as the National Defence Medal. So far, I have no details of who the Chair or the members of this sub-committee are, however once this information becomes available it will be placed on the NDM website. 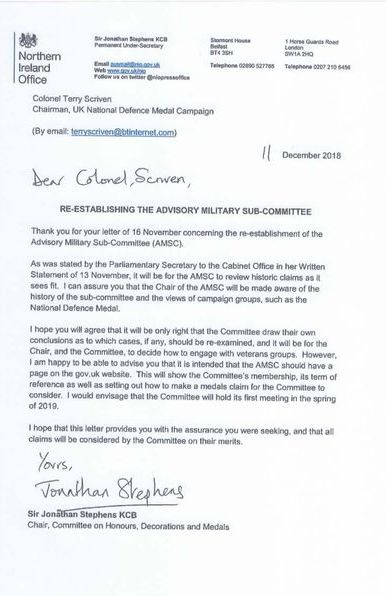 Sir Jonathan further informs me in his letter that it will be for the AMSC to decide how to engage with veteran groups and that this sub-committee of the Honours, Decorations and Medals Committee have been allocated a page on the gov.uk website. The AMSC will draw their own conclusions as to which cases, if any, should be re-examined and all claims will be considered on their merits. Although this situation takes the NDM and other medal campaign groups back to where they were in 2012, it is in the circumstances a major step forward in achieving a fair, open and transparent review of the submissions for medallic recognition, albeit sadly too late for many veterans who have been involved in these campaign groups. I have placed a copy of Sir Jonathan?s letter on the NDM website for your information with my Christmas message and will keep you updated on any further progress as it occurs. Freedom of Information Act requests submitted in respect of the medal review identified major failings. An inordinate amount of taxpayers’ money has been spent, especially on legal representation, in keeping hidden a murky process, which appears to involve the loss of government documents; failure to review some medal submissions; attempts to disguise the lack of thoroughness of discussions and unsound decisions made by members of the Honours, Decorations and Medals Committee; inaccurate and misleading statements to Members of Parliament and the likelihood misinformation has been presented to Her Majesty the Queen. (letter to Sir Jonathan Stephens dated 15 January 2018). Sue Gray, Cabinet Office Director General, Propriety and Ethics, has been requested to determine if there is a need for her to initiate any action. (letter to Sue Gray dated 15 January 2018). It is also likely the Parliamentary Ombudsman may be asked to carry out an in-depth evaluation of the whole discredited Cabinet Office sponsored military medal review process. I wish you and your loved ones a very happy Christmas and a healthy New Year. First let me apologise for the length of this letter but I thought you would wish me to provide you with as full an update as possible. It has been a busy year for many of our activists for which I would like to say thank you to them on your behalf. As you are aware as each year has passed, the activities of the various medal campaign groups have lessened due to old age, frailty, illness or in many cases death. Consequently in 2007 the National Defence Medal campaign was launched by representatives of these organisations coming together to make one concerted effort to achieve medallic recognition in their life time through a generic medal should their own claims fail. Sadly, this year, as in previous years, some of our veterans are no longer with us and our thoughts are with their families at this particularly difficult time of year. Our thoughts are also with those who are ill or infirmed especially those who have been so active in the various medal campaigns and the NDM campaign over the last ten years. We are all getting older. As in previous years, since 2014, my Christmas message focuses on the now discredited independent medal review, which was carried out under the sponsorship of the Cabinet Office. The subsequent revelations obtained by Dr Martin Halligan through Freedom of Information Act requests have caused and continue to cause much concern and disquiet within the veteran community. Dr Halligan uncovered the fact that the Advisory Military Sub Committee (AMSC), a sub-committee of the Honours and Decorations Committee (HDC), meeting minutes showed many of the same subjective comments recorded almost word for word as those which had been made in the previous discredited and aborted MoD medal review, particularly in respect of NDM costs. The AMSC failed to review the Korea Post Armistice medal submission, failed to review the National Service Medal submission, the British Cold War Medal submission and many others. Consequently, significant questions have been raised as to the veracity of the AMSC deliberations and the validity of the advice provided to the HDC from which it made its decisions in respect of the medal review. As a result of information received through Freedom of Information Act requests, our Chairman submitted a complaint on 14 February 2017 to both the Prime Minister Theresa May and to the Minister responsible for the Cabinet Office in respect of the flawed military medal review. He requested that an investigation be carried out into the way that the Cabinet Office had failed to carry out an open, transparent and fair review and requested the Military Medal Review be re-opended. A redacted copy of that complaint can be found HERE. It is a far reaching dossier and should cause concerns to all veterans in the way their submissions for medallic recognition have been dealt with. Sir Jonathan Stephens the Chairman of the Honours, Decorations and Medals Committee was tasked with looking into this issue and he directed that a former senior civil servant (unnamed) should carry out an investigation. That investigation report by the unknown senior civil servant dated 23 May 2017 can be found HERE. The investigation into the Chairman's complaint was lacking in fact, indeed some might assess it as being a fudge. On 28 July 2017 Sir Jonathan Stephens, on behalf of the Cabinet Office and presumably the Government, wrote to our Chairman, enclosed the investigation report and apologised that the Cabinet Office had used inaccurate costs which misled Parliament in respect of higher costs of the NDM. Sir Jonathan's letter can be found HERE. Our Chairman replied to Sir Jonathan Stephens on 31 July 2017 expressing his disappointment at the failure to carry out a thorough investigation of the complaint and the misinformation that had been circulating in the Cabinet Office about the National Defence Medal. Our Chairman's letter can be found HERE. Once again the veterans of the Nation have been let down. Now is the time for readers of the above documents, if they believe an injustice has been carried out, to write to their local MP and request that the military medal review be re-opened and all of the medal submissions made by the various medal campaign groups be reassessed fairly and in an open and transparent manner as promised by the former Prime Minister David Cameron. On 29th July 2014 a Ministerial statement was made in the House of Lords in respect of the Honours, Decorations and Medal Committee (HDC) decision not to institute the National Defence Medal and many other medal submissions, which included recognition of service personnel injured or killed in conflict, National Service, Korean Post Armistice, Cold War, Sub Mariners and Nuclear Testing veterans. The timing of this statement was questionable as it was made the day after Parliament had risen for the summer recess thereby avoiding debate by MPs. The HDC membership comprises seven of the most senior civil servants in the UK. This ministerial statement was surprising, it was as if the HDC had not been aware of the content of the submissions made by these veteran groups, many of whom had been campaigning for over 50 years. This resulted in Dr Martin Halligan submitting a Freedom of Information Act request to the Ministry of Defence to obtain sight of the minutes of the Advisory Military Sub Committee of the HDC (AMSC) meeting minutes of 29th August 2013. The AMSC had supposedly studied the findings of the Sir John Holmes independent military medal review, sponsored by the Cabinet Office, and made recommendations after their exhaustive review of the findings and submissions by the veteran groups to the HDC. The MoD refused to release the minutes, Dr Halligan appealed in August 2014. The MoD used their legal representatives to keep these minutes secret . During a three year period the MoD used every means at their disposal to prevent these minutes from entering the public arena, but eventually the appeal was upheld by the First Tier Tribunal which directed the MoD to release the minutes. These minutes were released in September 2016 and are contained on this web site. The minutes show that the case for the NDM and all the other submissions had not been rigorously reviewed. Both the National Service and Cold War veterans’ submissions were dismissed without any review, the NDM dismissed with discussions on cost only and not on its merits and the and Korea Post Armistice submissions documents not reviewed. The recommendations therefore that went to the HDC, from which these seven senior civil servants made their decisions on the medal submissions representing millions of veterans since the ending of the Second World War were totally flawed. However, it should be noted that FOI requests have failed so far to identify how many of these most senior civil servants were there to make the decisions. It was clear from this document, reluctantly released by the MoD, that the review, claimed by the Head of the Honours and Appointments Secretariat to have been transparent with decisions made as a result of extensive discussions through a careful and thorough review of submissions, in letters to veterans, service organisations and Members of Parliament, stretching over three years, was misleading and not correct. The Chairman wrote to the Prime Minister Theresa May, in November and December 2016, requesting a meeting to discuss the above revelations and requested the shameful military medal review be reopened. In both cases the Chairman’s letters were redirected by Number 10 to the Cabinet Office, Honours and Appointments Secretariat to reply. In these replies the points made by the Chairman were dismissed. This resulted in him submitting a comprehensive complaint on 14 February 2017 to the Minister responsible for the Cabinet Office about the lack of due diligence carried out by the Honours and Appointments Secretariat in respect of the military medal review and that action now be taken to recommend to the Prime Minister the medal review be revisited. Sir Jonathan Stephens KCB the Permanent Under-Secretary for the Northern Ireland Office and the Chairman of the HDC was tasked by the Minister to deal with the complaint. He in turn on the 30 March directed an examination (investigation) be carried out by a retired senior civil servant. On the 3rd April the Chairman requested that Sir Jonathan Stephens agree to the Chairman issuing a brief statement to veterans on the situation. As at today's date the 6 May no reply has been received, Parliament has been dissolved and a General Election is scheduled for the 8thJune. The campaign goes on to redress this injustice to millions of British Service veterans. It should be noted that there are six Freedom of Information Act requests still outstanding in respect of this cover up. Some have been on-going for over two years and most have now escalated through the Freedom of Information Act process to the First Tier Tribunal with one actually now reaching the Upper Tribunal. Both the MoD and Cabinet Office have spent extraordinary amounts of taxpayers’ money since 2014 in keeping out of the public domain information about a military medal review, which the former Prime Minister David Cameron stated should be an open and transparent process and draw a line in the sand once and for all. Veterans have suffered yet another injustice. FORCES sweetheart Dame Vera Lynn has got behind a veteran campaigners quest for medal recognition for all members of the armed forces. Roy Wilson wants a National Defence Medal (NDM) created for everyone who has served in the armed forces since the end of the Second World War. The British Government has never considered service in the Armed Forces as the sole justification for an honour. The liaison officer for National Service Veterans Association charmed the 94-year-old wartime songstress at the London Poppy Appeal launch, in Horse Guards Parade, in central London, last Thursday. Roy, along with campaigners David Kelly from Peterborough and Eddie Mortimer from Kent, presented Dame Vera with a report on the long-running crusade. Roy said: "She listened very intently, and the courtesy I got from her was lovely. But it appears the trio ignored official protocol to land the picture "coup" with Dame Vera. "Dame Vera was very polite and gave us our undivided attention, much to the annoyance of the time keepers." Said David, "Overall this was a fantastic coup for the campaign!" The whole NDM team wish to thank Roy, Dave and Eddie for their amazing effort.